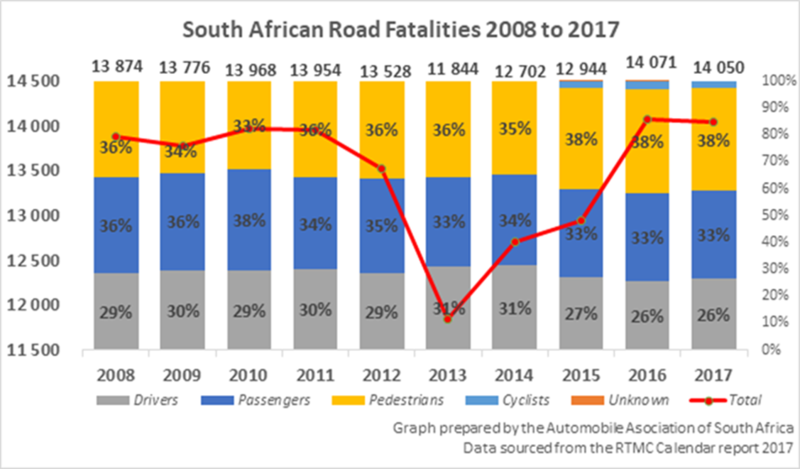 This graph, compiled by the Automobile Association using data sourced from the Road Traffic Management Corporation, tracks South African road fatalities from 2008 to 2017. The annual road fatality statistics for 2017, made available this month by the Road Traffic Management Corporation (RTMC), is another indication of the need for urgent road safety intervention on South Africa’s roads. The Automobile Association (AA) says the statistics show the situation on the country’s roads is worsening, despite numerous safety campaigns by government and non-governmental organisations. According to the statistics, 14 050 people died in road crashes on South African roads in 2017. This is marginally lower than the 14 071 people who died in road crashes in 2016 but still higher than any year from 2008 to 2015. It is also important to note that the preliminary Easter road fatality statistics – released earlier this month by Transport Minister Blade Nzimande – are 14% up over the same period last year. These figures, which are likely to climb, already do not bode well for the overall national road safety picture for 2018. “Seen against the backdrop of the fatality statistics over the past ten years (from 2008), these numbers prove that current road safety initiatives are simply not working. Since then, almost 135 000 people died in road crashes in South Africa. This is a shocking number which, without urgent intervention, genuine commitment from all role-players and a complete change in the attitude of all road users, will never significantly decrease,” says the AA. Encouraging employers to consider the wellness of employees, especially in relation to their commutes to and from work, through ensuring employees who walk to work are visible at all times, either through improving uniforms to make them more visible or making the use of high visibility sashes, vests or jackets compulsory; ensuring the safety of vehicles in fleets (or pool vehicles) and delivery bikes; and on-going internal road safety education to staff. “Reducing pedestrian fatalities by half will bring down the national figures by almost 20% (around 2 700 lives), a significant drop which will provide an immediate impact to reducing national fatality statistics,” says the AA. The AA adds that it is also necessary for all road users – including pedestrians and cyclists – to realise that government can do only so much to improve road safety and reduce the number of crashes and fatalities on the roads. “Unfortunately, too many South Africans have an extremely bad attitude towards safe road use and all the education and enforcement in the world will not stop those intent on playing by their own rules. Without a change of attitude among road users – and importantly, a respect for the law – efforts to decrease fatalities and crashes by a noticeable margin will fall flat,” the AA says. FleetWatch agrees fully with this sentiment.